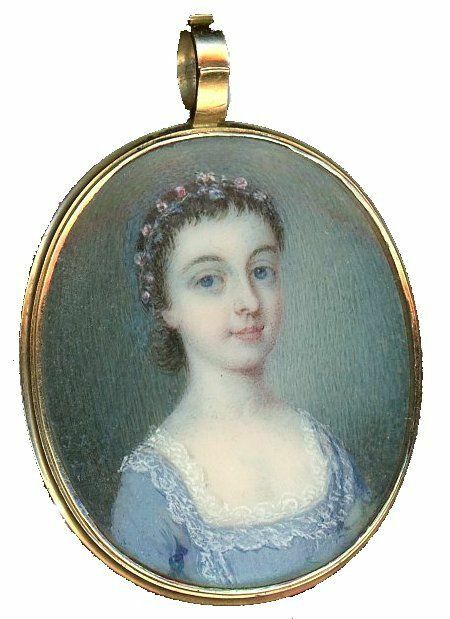 An enchantingly small portrait of a young Georgian lady wearing a sky blue dress with a square neckline edged with fine white lace. Her dark hair is drawn back to the nape of her neck and dressed with a pretty circlet of small blue and pink flowers. Watercolour on ivory signed with initials and dated — J.J. 1765 — and set in the original gold frame. Fine condition but with a couple of short scratches on the reverse side of the frame. James Jennings exhibited at the Society of Artists and later at the Royal Academy. The Metropolitan Museum of Art have in their collection a portrait of a lady painted by him.